This two hour and 20-minute historical drama chronicles the events surrounding the seventh manned mission of the Apollo space program that went awry and changed the planned Moon landing, which became a rescue mission guided by NASA’s ground crew. Most audiences know the outcome, yet the compelling journey propels this Ron Howard directed film to outstanding heights. Apollo 13 would have been the third landing mission to the moon. Tom Hanks portrays astronaut Jim Lovell who heads a crew that also includes Fred Haise (Bill Paxton) and Jack Swigert (Kevin Bacon). 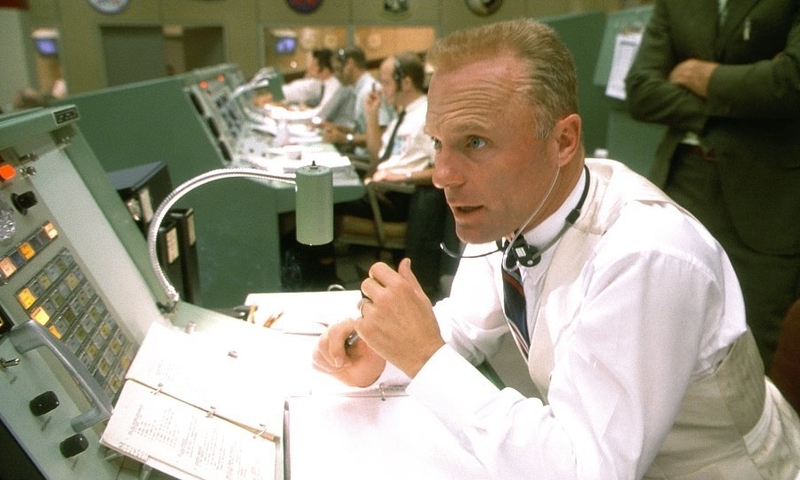 Astronaut Ken Mattingly (Gary Sinise) and NASA white team flight director Gene Kranz (Ed Harris) provide extraordinary support in an extraordinary situation. Donald Kent “Deke” Slayton (Chris Ellis), NASA’s first Chief of the Astronaut Office, uses his experience to help the flight team on the ground. The pacing builds well and results in several edge-of-your-seat sequences. Jim’s wife Marilyn (Kathleen Quinlan) provides a unique view into an astronaut’s family life and how family members cope with the stress, danger, and hectic schedule. One sequence with Lovell and his son sets the high stakes stage perfectly. Dad shows his son a procedure the ship will do then the son asks if he knew the astronauts that died in a fire accident. There is a scene when Lovell tells a personal story about how he lost his way in a plane but then algae lit his way and “guided me home,” should have included some visuals, but was a missed opportunity. Howard concentrates on his Lovell and his relationship with his son which doesn’t make a whole lot of sense because Lovell’s son plays an incidental role in the plot. Otherwise, the film’s technical brilliance, authentic set design, excellent casting, and convincing visual effects provide high-level entertainment. James Horner’s Oscar-nominated musical score enhances these unique scenarios while various songs set the tone of the times and include “Honky Tonkin'” performed by Hank Williams, “Blue Moon” performed by The Mavericks, “Night Train” performed by James Brown), and “I Can See for Miles” performed by The Who. Apollo 13 was an Oscar winner for best sound and editing. Highly recommended (**** out of four stars) and rated PG for language and emotional intensity. This entry was posted in 1990s Film Reviews, Film Reviews and tagged Apollo 13, Film, Michael Siebenaler, Mike Siebenaler, movie, movies, Tall Writer. Bookmark the permalink.